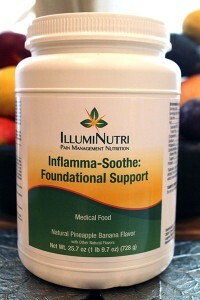 Click the button below to add the Inflamma-Soothe Foundational Support to your wish list. Inflamma-Soothe: Foundational Support is an FDA approved medical food designed to provide nutritional support for anyone suffering from an inflammatory bowel condition. The low-allergenic rice based powder contains a harmonious balance of natural Eastern and Western ingredients that have been found to ease both pain and inflammation. The powder has been formulated to support Phase II of detoxification (including the liver, kidneys, lymphatic system and gastrointestinal mucosa). Blend, shake, or briskly stir 2 level scoops (52 grams) of Inflamma-Soothe: Foundational Support into 8-12 fluid ounces of chilled water, juice, or fruit. Follow recommended dosage guidelines (Program Guide) or as directed by your healthcare practitioner. For best texture, consume within 10 minutes of reconstitution. These products are not intended to diagnose, treat, cure or prevent any disease. Consult your physician prior to using any supplemental products.